But that doesn’t mean that outbound email marketing campaigns and a paid social media marketing strategy have no place in inbound marketing. They simply have to be used strategically and sparingly. Outbound emails are a standard part of a complete inbound campaign, but keep in mind these guidelines for using them effectively without turning off potential customers. Also, consider how to best incorporate paid options into your social media campaign to maximize your inbound marketing results. Outbound emails shouldn’t be sent to everyone who has ever opted in for your email list or interacted with your business website. Instead, both the email itself and the offer it is promoting should be targeted to a specific segment of your email list. That segmentation could be by geography, job title, industry, past interaction with your site, or some other criteria. One place to start would be to segment according to your buyer personas, which already take many of those characteristics into consideration. A recent MailChimp Study found that segmented lists resulted in a 14.4 percent higher open rate and 14.9 percent higher click rate than non-segmented email lists. #2: Don’t overwhelm email recipients. While 86 percent of consumers say they would like to receive promotional emails from companies they do business with at least monthly, only 15 percent want them daily. And, according to HubSpot, 78 percent of consumers have unsubscribed because a brand was sending them too many emails. A strategy that involves fewer emails, each of which offers a greater value, is more likely to succeed in bringing visitors to your website. While your outbound emails may not always have the same level of personalization possible in nurturing emails, they should still be focused on offers that are relevant to the personas targeted and that have a high value for readers. Use outbound email marketing to offer recipients reports about their industry or job function, templates they can put to use immediately, webinars for learning more, or free trials of a product or service. You’ll find more tips on creating emails that generate results in this post from HubSpot. #4: Use paid social media to target specific audiences. Segmenting is also key in targeting social media advertising to maximize your spend by targeting the audiences that fit your ideal customer for each specific ad you create. Since many paid social media opportunities are pay-per-click, it just makes sense to ensure that your ads are seen and clicked primarily by those audiences most likely to become customers. For Facebook, you can use the in-app ad management platform to target ads by genders, age group, geographic location, interests and “liked” pages, or even by employer. Facebook ads appear in three places on the platform: as a sidebar, in the desktop news feed or in the mobile newsfeed. This article from HubSpot highlights each type of ad with examples of how each can be optimized for best results. #5: Consider boosting organic social media posts that were highly successful. As we create our inbound campaigns, we always include organic social media posts to promote both the blog posts related to the campaign and the individual downloadable assets or offers themselves. Those organic posts should include ones published on the same day as the blog post, as well as posts that appear in the days, weeks or even a month or two after the initial push. By boosting a post, however, you can put it in front of more potential viewers, and, if you follow the instructions included in this video from our partner HubSpot, rather than just clicking the “Boost” button, you can target your audience by location, pages liked or other criteria to get the greatest potential ROI. Get more tips from HubSpot on optimizing your paid social media efforts here. 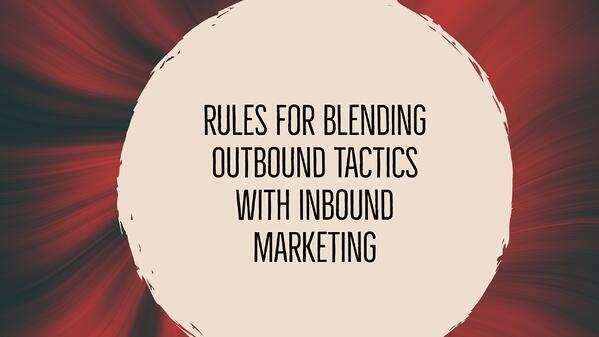 Make sure all outbound tactics bring prospects to your site, where they can convert into leads. Of course, inbound marketing — even when using outbound tactics such as emails and social media advertising — is still focused around bringing prospects to your website with quality content that captures leads and guides them toward a purchase decision. Therefore, every email and social media ad should be part of a coordinated inbound marketing campaign, focused on bringing prospects to a specific landing page and enrolling them in a lead nurturing workflow. It is all part of a singular effort. Take a look at how it all comes together in this sample one-month campaign for JONES client and Missouri-based healthcare consulting firm Primaris, who used inbound marketing to launch into the nationwide commercial market and transitioned from a virtually silent web presence to generating more than a thousand online leads in the first year of inbound marketing. Download the sample campaign here to see the actual text of the assets, landing pages, blog posts, social media posts, nurturing emails and outbound emails that fueled one of their most successful campaigns.